Your mother has always cradled you since you came into her life as a treasured gem. 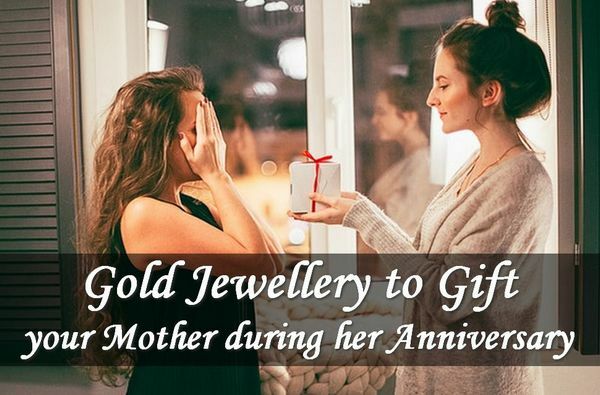 What better way to thank her for her contributions than spoiling her with some beautiful gold jewellery during her anniversary? We have crafted a range of ideas that you can choose from to gift the choicest jewellery available which are both modish and traditional. A sleek gold chain never runs out of fashion. Whether you sport it on special occasions or regular use, chains are a mark of sophistication and elegance. To round it up you could also go in for some ethnic pendants keeping in mind the width of the chain you plan on buying. A solid gold pendant usually requires a thicker chain to compensate for the weight. However be sure to compare gold chain price of different designs before making the final purchase. The length of the chain also holds crucial importance. Gold chains for daily use should generally be of medium length, preferably eighteen inches. Smaller variations of sixteen inches (chokers) or longer of twenty four or thirty inches are extremities that you could glamour in on special occasions. The mark of a special anniversary lies in the ring. A solid gold ring could be worn almost on a daily basis. You might also want to go for vermeil which is basically when silver is electrolysed with a coating of gold. Indubitably it comes off as way cheaper but posits the additional nuisance of wearing off before time. If your ring has a stone setting it is mandatory that you are aware of the specifications of the prong. A weaker prong will soon disintegrate loosening the precious stone. Better settings are usually of platinum but cheaper options of rhodium plating will also keep the stone in place. When buying earrings a good advice is to always avoid stone settings. Earrings are much more fragile than other ornament types and one is more likely to kink it. Heavy jewellery has very little magnetism in that it can unequivocally not be used daily and would be a herculean weight for your ears to bear. A gold top carved with intricate ethnic design or a sleek dangle would not only look gorgeous but be a much more creative option. A hoop or barbell is a quirky alternative you can purchase only if you are too sure to bet on her strict preferences. Bracelet is almost an aristocratic opulence. Although a lot of shapes are prevalent for customers a sagacious option would always be to stick to oval and circular. Because a bracelet reserved for special occasions you can conveniently choose it on degrees of high purity without the worry of breakage or disintegration. You could either choose one thick bracelet or several thin ones depending on design and preference. Make sure that you choose the correct width or invest on a durable clasp before making the final purchase. Gold is an investment for a lifetime. Notwithstanding its tensile strength and high durability, it forms a legacy of each family – a prized treasure that generations bequeath. Your special gift is emblematic of a rich tradition of this fine metal which could both be the ostentatious refinement of the nobility as well as the smiles on the faces of proud moms.